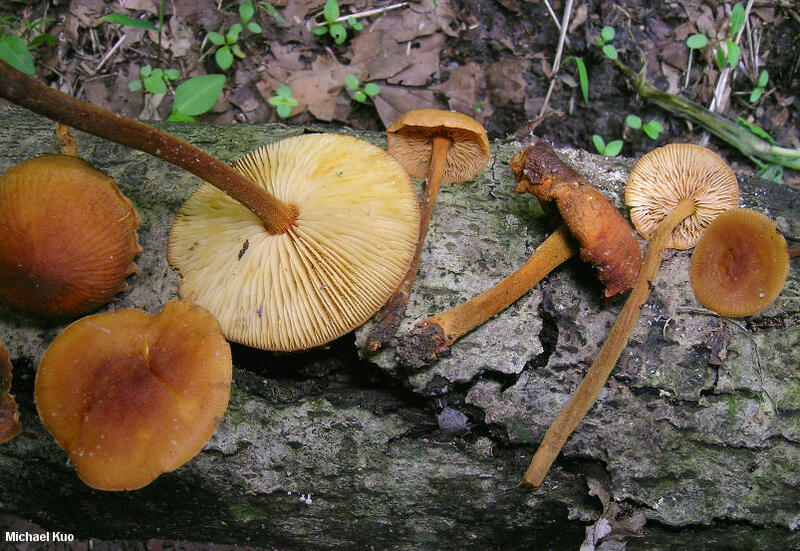 Xeromphalina tenuipes is a late-spring, early-summer species from eastern North America's hardwood forests. 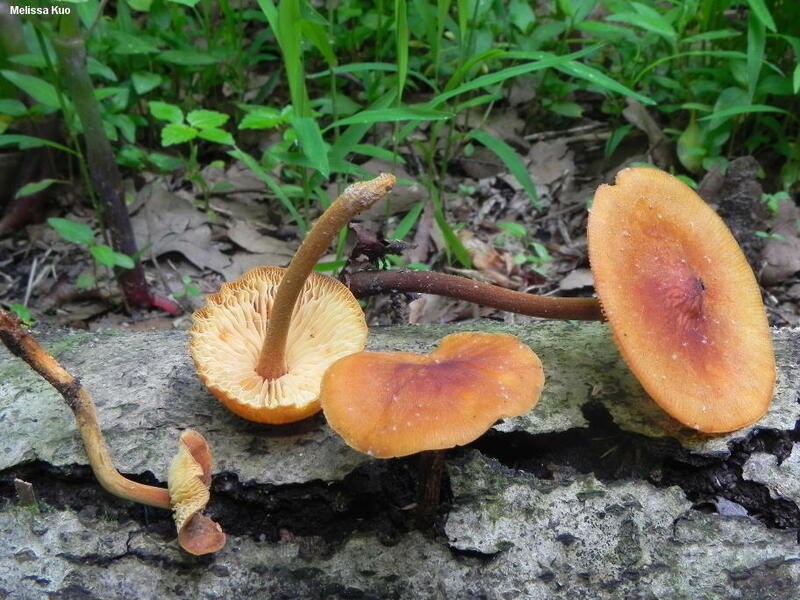 It is easily overlooked--especially since its caps are fairly small and orangish brown, like the caps of many boring little mushrooms. 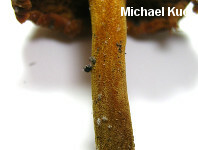 But close examination in this case reveals a gorgeously fuzzy stem surface, along with cool microscopic features. Ecology: Saprobic on the deadwood and woody debris of hardwoods; growing scattered to gregariously, or in loose clusters; often appearing not only on fallen logs but also in terrestrial troops alongside the logs and woody debris; late spring and early summer; widely distributed in North America east of the Rocky Mountains, south to Central America. The illustrated and described collection is from Indiana. Cap: 2.5–4.5 cm across; convex to broadly convex or flat; finely granular-velvety, or nearly bald; dry; becoming finely lined; brownish orange, often with a darker center. 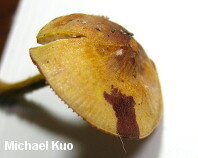 Gills: Notched at the point of attachment to the stem; close; often forked and cross-veined; whitish to yellowish; short-gills frequent. 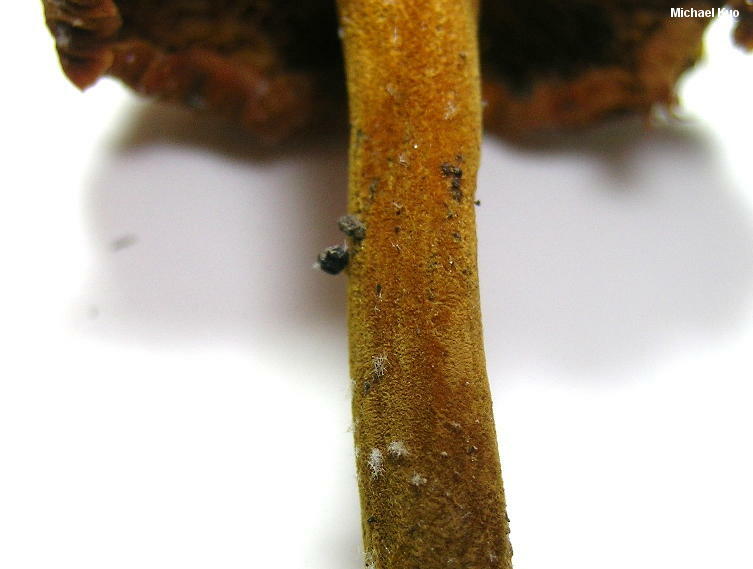 Stem: 3–7.5 cm long; 2–4 mm thick; more or less equal; dry; densely and finely hairy; golden orangish, darkening to brown from the base upward; fairly tough. Chemical Reactions: KOH dark reddish brown on cap surface. 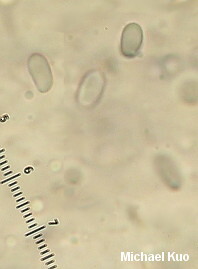 Microscopic Features: Spores 6–8 x 3.5–4.5 µm; ellipsoid; smooth; faintly to moderately amyloid. Pleurocystidia clavate to fusiform. Cheilocystidia narrowly clavate. Caulocystidia more or less cylindric; thick-walled. Pileipellis with reddish brown pileocystidia in fascicles. REFERENCES: (Schweinitz, 1887) A. H. Smith, 1953. (Saccardo, 1887; Miller, 1968; Smith, Smith & Weber, 1979; Phillips, 1991/2005; Bessette, Miller, Bessette & Miller, 1995; Barron, 1999; Roody, 2003; McNeil, 2006; Kuo & Methven, 2014.) Herb. Kuo 05121203.